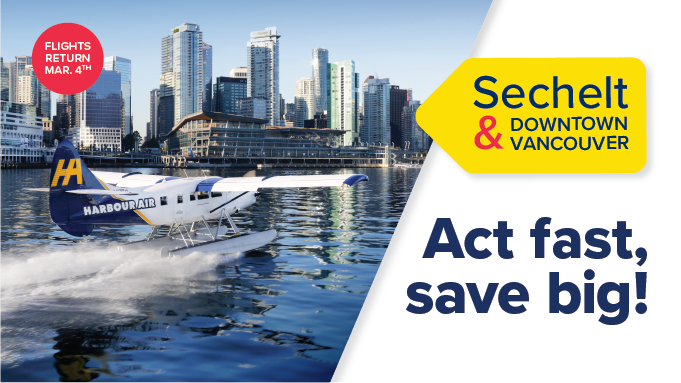 On Monday, March 4th direct flights between Sechelt and downtown Vancouver resume after a seasonal pause in service, and we’re celebrating with a special offer! When you book by March 4th, find select one-way fares between downtown Vancouver and Sechelt for just $68 all season long. Booking is easy! Simply look for “GoFlex – Special” fares when booking online or via our new mobile app, or call our friendly reservations team at 1.800.665.0212! A limited quantity of “GoFlex – Special” $68 fares are available per flight. Once they’re gone, they’re gone! Discount is not valid for unaccompanied minors or on private flights. Bookings can be made online, in-person, or over the phone.